Lori and I popped up to Lake Nockamixon and Lake Galena on Sunday to try to see some Crossbills. No luck with those, but we did manage to get a very rare bird - the Pink-footed Goose. 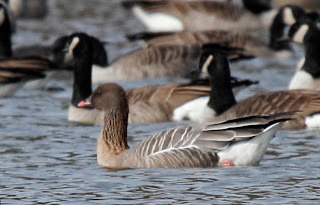 This Pink-footed Goose was seen by August Mirabella a few days ago and has been on the lake since. 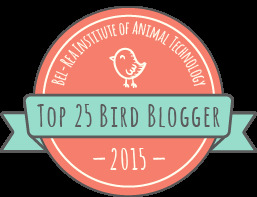 It must be the same bird that he found last year and that stayed for a week on Lake Galena. How fortunate that we stopped by. How fortunate that we learned long ago that when searching for a super rare bird, don't look for the bird - look for the birders. That tactic paid off again when we saw a few people with binoculars and scopes hanging around one of the boat ramps not looking at anything. Then, just as we were joining them they all started running towards their cars yelling "It's at the bridge, it's at the bridge". Well, Lori and I dragged the dogs back to the car and followed them to the bridge. 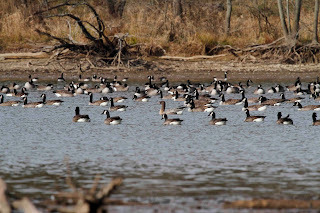 There had to be a thousand geese swimming around the lake. 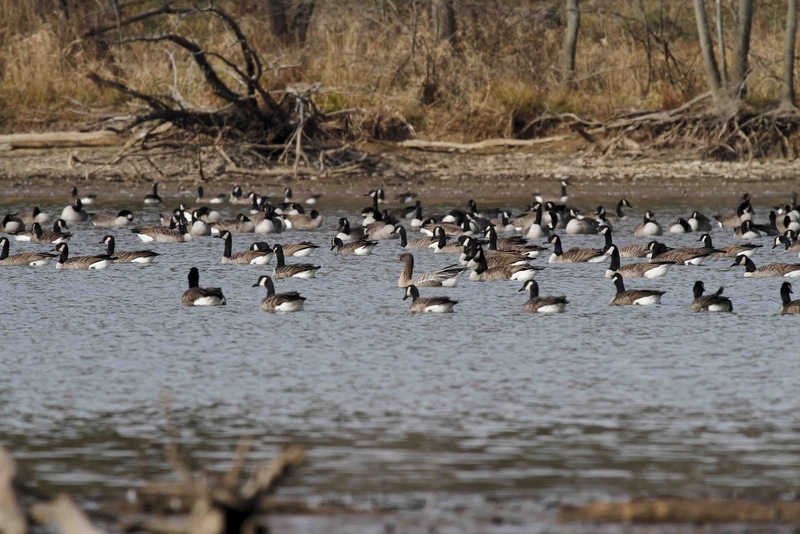 Honestly, who could find something different in a sea of Canada geese? This photo shows only a few dozen of the throngs, but the Pink Foot is right in the middle. Take a good look. Here it is cropped. Not really in focus, but good enough to see the pink bill and pink leg. Pink-footed geese live in Greenland and Iceland. They winter in Great Britain. How did this bird get so off course? Twice? Pretty strange. While we were there, it let out a honk that made everybody laugh. Now, those of you who have seen the movie "The Big Year" with Steve Martin, Owen Wilson, and Jack Black probably remember the angst that they had trying to see that particular bird. I think they finally had to found the goose swimming in a hot spring in the Rocky Mountains (which is completely implausible by the way). All we had to do is drive 30 minutes to our lake.